Caracas has an old colonial heart centred around its Plaza Bolivar. This is the prime tourist hangout and it is worth coming here for the amazing people-watching on hand. Many notable attractions surround this historic core, such as museums, theatres and some very nice architecture. Don't forget to rise above the city via the El Teleferico cable car, a major tourist attraction here. The city's modern cable car will whisk you to the best views in Caracas. There are also great live performances in this vibrant city. Pick up a copy of the weekly entertainment guide to find out what's going on. The city's popular urban Parque Central is the best place to unwind and check out the locals at play, or you can head to the university and watch a professional baseball match. Once the heart of colonial Caracas, the block known as the Plaza Bolivar is one of the most interesting corners of the city. With its towering El Libertador statue in the centre, this is the place to hunker down on a park bench and watch the locals pass by. Within a four-block radius of the plaza are several significant attractions like El Capitolio Nacional (the National Assembly, formely known as the National Congress) and the huge mausoleum Panteon Nacional. 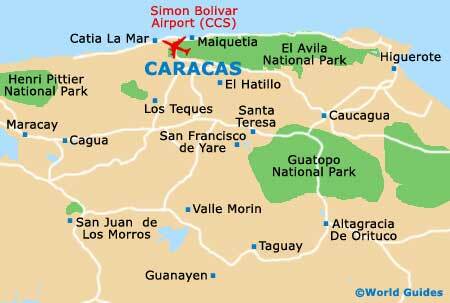 You can also find museums, cathedrals and the home of Simon Bolivar. While it is fairly safe around here during the day, it is generally advised not to visit the plaza after dark. Residents of the capital love their sprawling urban park, and you will too if you enjoy a casual walk and a bit of people watching. The Parque del Este is situated on the far easterly outskirts of the city, being close to the military's Generalissimo Francisco de Miranda Airbase, the Transport Museum and the Centro de Arte La Estancia. Mornings are a good time to visit, when literally hundreds of locals come here to practice tai chi, jog, play soccer or do yoga among the grassy lawns. Paths meander through the park with plenty of benches to rest on. There's even a little zoo, a large lake (Lago Sur) and the Humbolt Planetarium, which is open on the weekend. Central Park lies on the eastern side of the city centre, close to both the Parque Los Caobos and the Jardin Botanico, and within walking distance of the Universidad Central campus. This spreading attraction is not quite as green as the name would indicate, being instead more of a concrete plaza complex with a number of high-rise buildings and two towering octagonal skyscrapers - the West Tower (Torre Oeste) and the East Tower (Torre Este). For some of the best cityscape views possible, head to the 49th floor of the Torre Oeste, where an observation area awaits. Of course, many tourists also come to the Parque Central to check out its cluster of quality museums and to visit the adjacent Teresa Carreno Cultural Complex. The park is well connected by public transport and is conveniently close to the Bellas Artes metro stop. This modern cable car system named the 'Teleferico' has become something of an icon of Caracas and is absolutely the best way to reach the top of the El Avila Mountain, towering over the city in the north. The ride takes about 15 minutes to cover the nearly 3.5-km / 2-mile stretch from the Mariperez Station to the summit, where on a clear day you can see across the city and all the way down to the Caribbean Sea. On the summit is a handful of restaurants, souvenir shops and a few recreational facilities, in addition to a 205-acre / 83-hectare national park where you can wander around freely. Take the cable car back down or enjoy one of the hiking trails leading to the streets below. The most important live performance venue in Caracas, if not all of Venezuela, is this amazing theatre centre, which opened in 1983 and is situated within the Parque Los Caobos, just across from the Parque Central and connected by a narrow footbridge. The best classical and modern concerts are held at the Teresa Carreno Cultural Complex throughout the year, along with opera, ballet and general theatre performances. There is also a small exhibition dedicated to the life of acclaimed Venezuelan pianist and the namesake of this particular attraction, Teresa Carreno (1853 to 1917). The Ateneo de Caracas is a good alternative for modern theatre or cinema, while the Trasnocho Cultural in Las Mercedes is popular for its diverse schedule of movies, live music, theatre and other performances. This hot bar is undoubtedly the best place in Caracas to get out on the town. As the name implies, the views from the swanky 360° Roof Bar are simply spectacular. Covering three floors of the Altamira Suites Hotel, there are several different drinking areas, including a large indoor space and numerous outdoor nooks and crannies. Even if you just come up for an evening drink, the views over downtown are worth it alone.